This is my 3rd time windsurfing. I have a JP Funster 205 which I really like. I am about 210lbs and 6'4" tall. I windsurf on a lake and the average wind speeds are 5-15mph and very gusty...long lulls as well. Usually windspeed is about 5-7mph. I can't jibe and I'm not in the straps yet but can tack back and forth and stay upwind. I don't fall down that much anymore. I currently have 2 older sails, one that is a 5.4 and a 6.4. Both have cams and are a pain to rig. I bet they are at least 10-15 years old. I am looking for a sail that is easy to rig, light weight, easy to control, powerful (i.e can get me going in lightwind) and has a large wind range. I thought something in the 6.5-7.0 range would work for my level and riding conditions but would prefer an expert opinion. Also, I only go a few times a year so I don't want to spend a lot of money. So maybe a used sail, last years model, etc. And finally, my mast is 460cm and imcs is 25. Average diameter is 41mm. Looks like the model is a CK95 PRO Racing. Get the biggest no cam sail you can fit on a 460-7.5 and up . 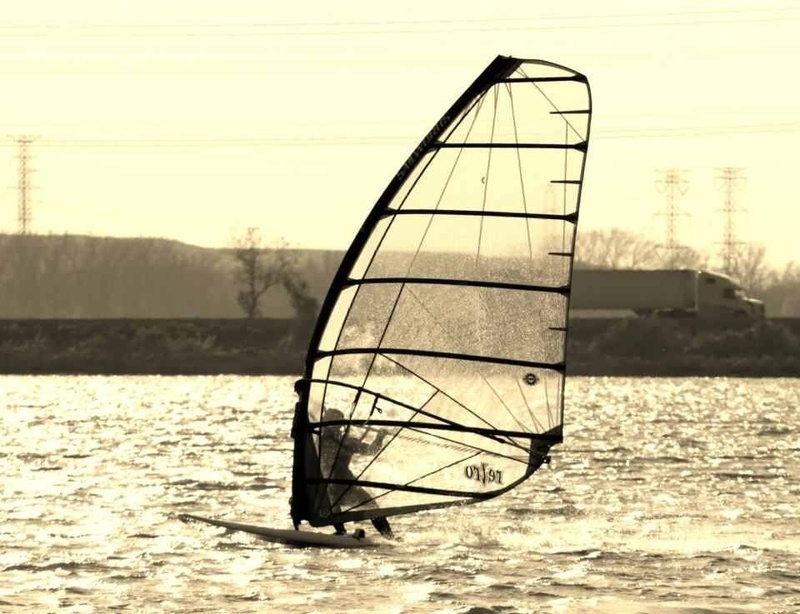 You are big guy on a big board on a lake with light wind-you need as much power as you can get. With power comes speed and gybes, waterstarting etc. and most of all fun. Don't stop here aswell-as soon as you get comfortable with the sail you get start planning for the next bigger one . Start collecting modern 7 batten sails , preferably same brand and model with the recommended masts /slowly , one of a time budget depending, 2 will suffice/. Lets say 8.0 and 9.5 or something like that. I'm a fan of the big Retros personally . You are asking a tricky question with no easy solution. I am about your weight, use a longboard, sail on lake and was at your level not so long ago so I feel qualified to risk an answer anyway. You have first to realize that buying a sail by itself is not possible. You have to consider your boom and mast too. To add to the complexity, you also have to consider the rest potential sail quiver. You want nice spacing between your sails. This can be detailed and discussed ad nauseam. To help you, consult James Douglass sail calculator on the web. With this tool, and actual on water experience, I decided that a good theoretical quiver of 9.5, 7.5, 6, 5 and 4.2 sails would be great for me. This can be a base for you too. You are also asking for a one-sail solution. In that case, I advise you to consider a Kona One or Aerotech Zenith sail in 9.0 size (your weight class). These sails are light, have a huge tuning range and can be sailed by rec racers between 0 and 25 kts. Their draw-back is that they are tricky and non-conventional to tune, and are also less stable than other sails. I have one and I like it. I will however eventually indulge myself and get a 9.5 twin-cam freerace sail in order to have more stability when the conditions require it. Finally, for really light non-planing winds, an old 6.0 or 6.5 Dacron sail without the full battens is hard to beat. They are really light and catch the smallest breezes. They are just not fun in stronger winds. You can find one for free, and it will fit most 460 mast. Thinking about what I wrote, and because of the wind conditions you describe, I think you should skip the 7.5 and buy a 9.0. They can be found used, at least at Sandy Point. Don't base your sail choice on the old mast you currently have-you'll get rid of it eventually . Just take the size into account to be able to use it until you get the recommended one for the new sail. As already said, mast should match sail if possible. If mast/sail bend is close you can get away with it with non-cam (RAF) sails. Many modern 6.5 sails rig on 430's today so figure on needing a low 7 meter sail. I would tell you to find a super inexpensive 10 year old sail without cams in the mid 6's to continue practicing on & take your time looking for an 8.0+ meter sail that fits your mast if you want to keep the budget low. Also consider for the conditions you are describing a Kona and one large RAF sail is all you would need in the long run. weight and conditions, you'll be wanting all the sail you can get. p.s. I am not a heavy weight (180lbs) but I am 6'3". My suggestion is to start with a fabric sail, like a Hot Sails Superfreak somewhere in the range from 6.3 meters to 8.0 meters. Beginners are very hard on equipment until they get their sea legs, and the Superfreaks can take most of the falling and banging that comes with learning how to windsurf on a lake. Small tears in the fabric can be repaired using a home sewing maching, and should you have a big tear, you can pull the battens out, fold up the sail and send it off to be repaired. As you grow to intermediate status, you can build a quiver of sails around the type of sailing you enjoy most and your budget. I checked Craigslist using www.zoomthelist.com which does a nationwide search of Craigslist sites and found an 8.0 Superfreak in Portland, Or. for $175. That listing had expired, but you might be able to search other classifieds in Portland and the Gorge to see if the owner placed other ads for the sail. Also, you might put a "want to buy" ad on Craigslist or other windsurf equip. classifieds in the Portland area. I'm in no way associated with Hot Sails Maui, but I do think their Superfreaks are excellent choices for beginners and make a durable sail as your skills improve and the dacron cloth holds up very well to UV exposure. Modern no-cam sails actually have a bit LESS power for their size than old cammed sails. So if you buy a modern 7.0, it probably won't give you any more power than your old 6.4. It WILL be easier to rig and easier to handle... but if you were hoping for more power you'll be disappointed. To get significantly more power you will need to make a bigger jump up in size, to something in the "as big as will fit on a 460 mast" category. Sails are shorter and wider nowadays, so most 7.5 sails and some 8.0 sails will fit on a 460. You might want to measure your boom, though, to make sure that the new sail won't be too big. Others have suggested some good sail brands, like Ezzy, Sailworks, and Hot Sails Maui, but I wouldn't stress too much about the particular brand. As long as its the right price, the right size, no cams, and less than 10 years old, you'll be happy.